You can attend the church services at the Church of Assumption of Our Lady in Grunta every first Sunday of the month at 11 AM. If you are interested in visiting the church, please contact Lubomír Krátký at krat.lub@seznam.cz. he Church of the Assumption of Our Lady in Grunta stands on the site of the original church dedicated to the Visitation of the Virgin Mary, the history of which dates as far back asthe 13th century. Grunta was an independent parish until the end of the 14th century, and later fell under the administration of Kutná Hora. 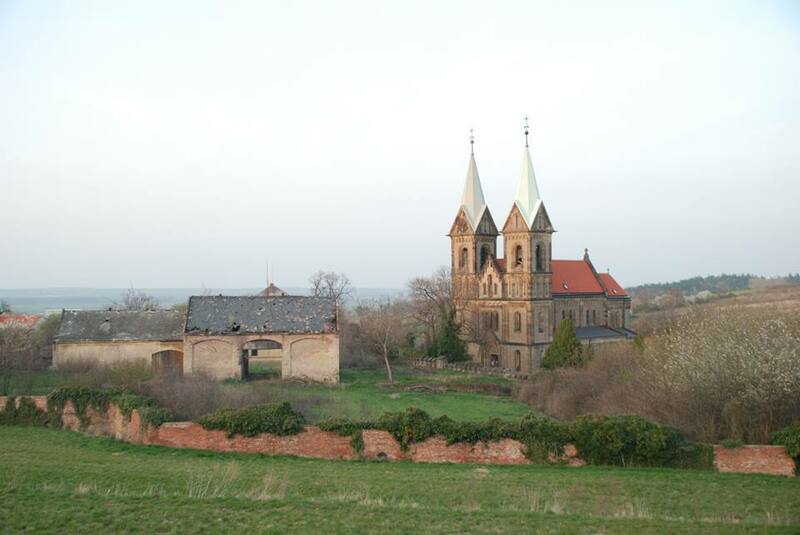 In the 18th century, it was annexed to the new parish created in Kaňk. From that time onwards, the church fell into disrepair, with the bell from the 15th century and the tombstones of the Lords of the Libenický family of Vrchoviště being the only remains surviving to this day. Grunta’s citizens had ende avoured since the mid-19th century to have a new church built and the renewal of a separate parish. This parish was established on 1 August 1900, with the building of the church commencing in 1905 on the site of the earlier church. Josef Doubrava, Bishop of Hradec Králové, was one of the major initiators of the church‘s building, mainly influencing the appearance of its interior decorations. Jan Kubelík, the violin virtuoso, was oncean important secular patron of the church. 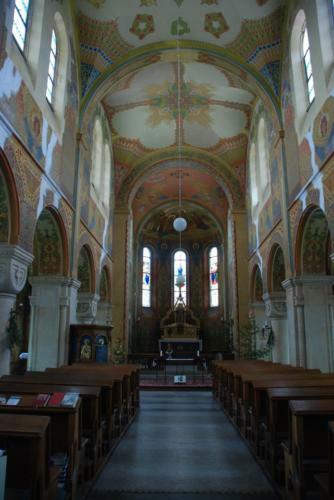 The church was built according to the plans of Rudolf and Jaroslav Vomáčka of Prague in the style of a pseudo-Romanesque basilica, with craftsmen from the surrounding area contributing to the work. 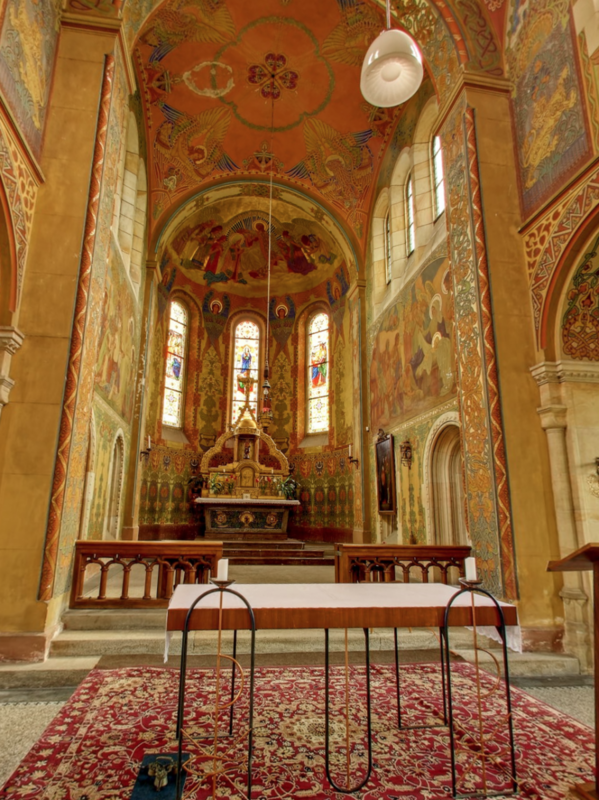 The most artistically interesting and valuable part of the whole church are its interior wall paintings, unequalled in the Bohemian countryside. 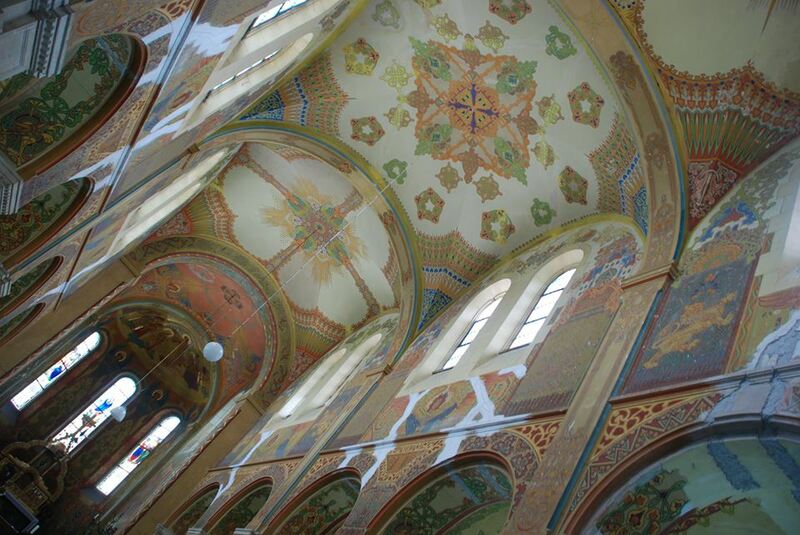 They arefull-wall Czech Secession frescoes, painted by Marie and František Urban, who studied under Alfonse Mucha. An old bell is installed in the church tower, which was made after 1495 by Ondřej Ptáček, Kutná Hora‘s bell maker. Church visitors can also seethe preserved tombstones of the Libenický family of Vrchoviště. 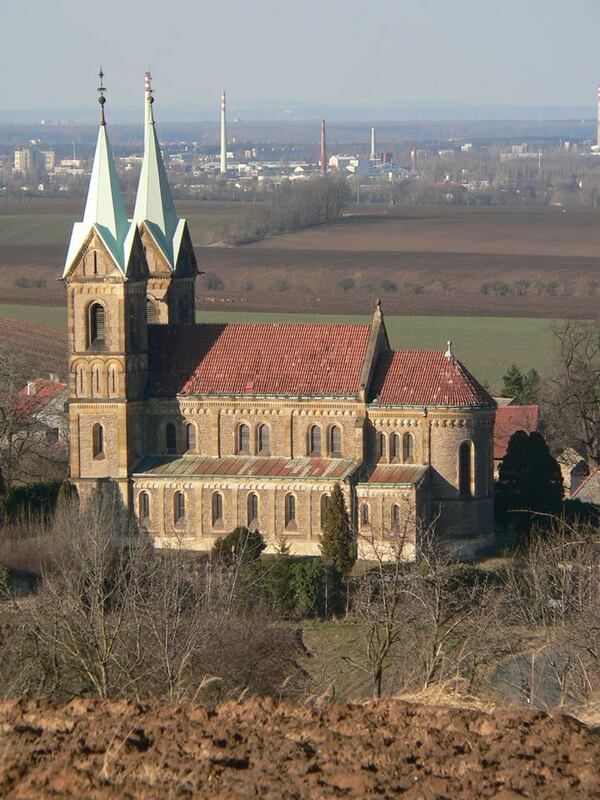 As of 2007, Grunta is once again part of the Kutná Hora parish. The structural stability of the Church of the Assumption of Our Lady is now severely impaired. This problem is most evident in the crack which permeates the entire circumference of the envelope as well as the structure’s subsoil in the places where the towers are attached to the nave. 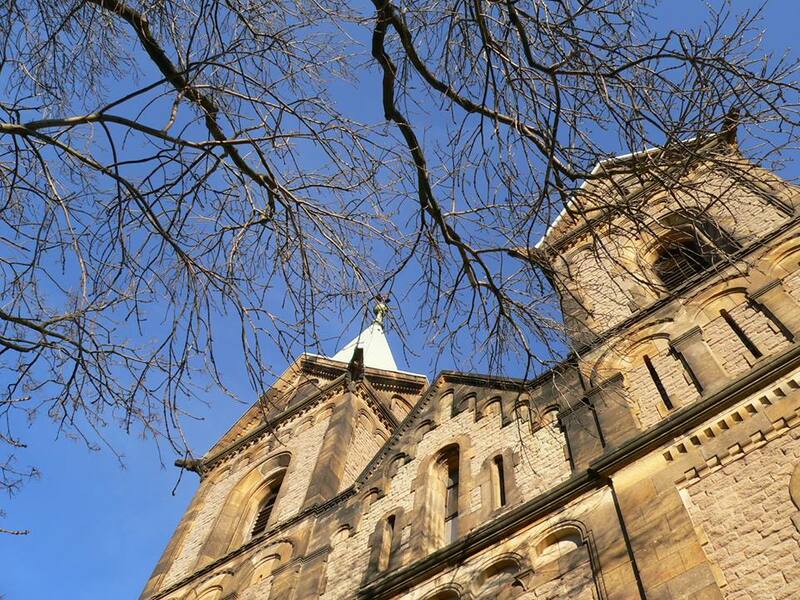 This may be due to the diversity of the subsoil beneath the church or the significantly different weights of both parts of the building, which could lead to their spontaneous separation. The roof was completely repaired in 2010, thus stopping rainwater from leaking inside and causing damage, especially to the rare frescoes. The condition of the church should not deteriorate from now on, however funds are still lacking for its total reconstruction.